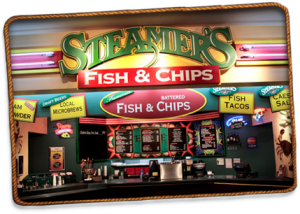 Steamers Seafood Cafe is the perfect casual seafood restaurant to enjoy fish & chips and a variety of seafood selections in Tacoma. As the true Pacific Northwest experience; we invite you, family and friends to come taste our signature fish and chips, award winning clam chowder, excellent fish tacos, great Northwest microbrews and Washington wines. We guarantee the best seafood selection in casual dining throughout the Pacific Northwest. Come check out our locations above and various seafood platters will leave you completely satisfied.